With the combination of Geostationary Meteorological satellites and the GPM constellation, rainfall information is gathered with very high spatial and temporal resolution (hour / few kilometers) compared to the expected sampling of the SWOT mission. This small scale information on rainfall – together with hydrological modeling – would be useful to document and potentially predict discharge variability between SWOT overpasses and help developing value added, high resolution SWOT discharge products. A promising use of SWOT data is through hydrological models ; for instance through data assimilation of SWOT derived water heights or SWOT derived discharge in hydrological models ; Paris et al. have also derived a method to generate a SWOT discharge 'first guess' product using model/observation trained height/discharge relationship. For both type of applications, understanding the uncertainties in the model based discharge and quantitative information on the hydrological model error structure is crucial. One important source of error in hydrological simulations is the propagation of the errors from the forcing fields – like rainfall. The first contribution of this proposal - in link with other SWOT proposal - is in assessing satellite rainfall product performances and uncertainties over several Tropical basins, understanding their scale dependence, analyzing the error structure (i.e. space-time correlation) and studying their propagation through hydrological models, for discharge simulation in various hydro-meteorological context. The project will benefit from the experience of CPTEC in the domain of rainfall estimation and validation, and rainfall error propagation in Brazil (Falk et al. 2015 a and b), and of the French Megha-Tropiques team over Africa (Casse et al, 2015, Roca et al, 2015). The data from the CHUVA campaigns (Cloud processes of the main precipitation systems in Brazil: A contribution to cloud resolving modeling and to the GPM) and from the future SOS (Sistema de Observaçao e previsao de tempo Severo) project provide radar based rainfall estimates under many rainfall regimes in Brazil. In Africa, high resolution gauge network and some radar data has been collected through the MTGV effort. This reference data sets are quite unique in the Tropics. Satellite rainfall products (and their associated error model when available). High quality ground based observations in dedicated GV sites (Africa and Brazil). A hydrological model (MGB) set up in several basins of interest. Discharge data from in situ observations (scarce and when available). Altimetry data from observations (current satellites) or simulations (to emulate SWOT data, using SWOT simulator in pre-launch period). Ensemble rainfields accounting for uncertainties, developed in the present proposal, will feed into the MGB model which has been already set up in several Brazilian basins, including the Amazon (Paiva et al. 2013) and in 2 major rivers in Africa: Congo and Niger. Model output and the discrepancies with observation will be analyzed. Sensitivity studies will be carried out to assess the impact of various type of uncertainties (from the forcing ; from the model ; from the altimetry data and specially its sampling ) in the predicted discharge. 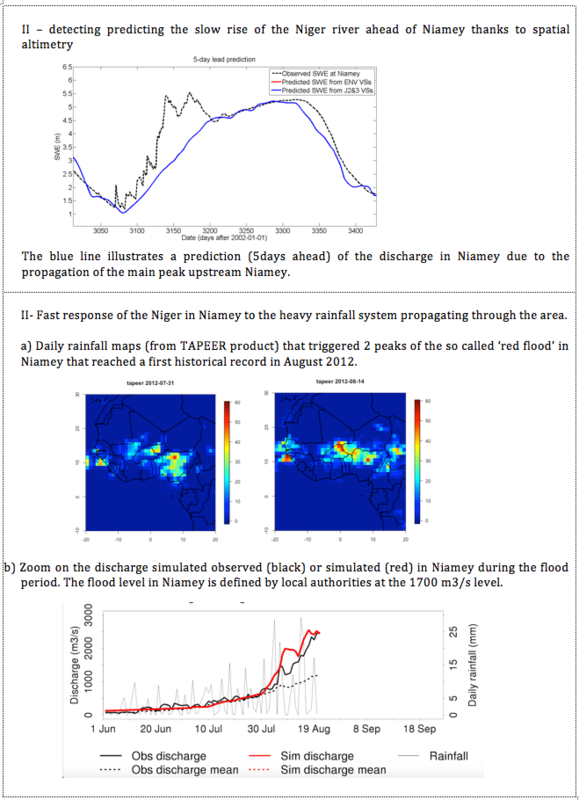 Figures 1 and 2 (below) illustrate some of the expected outputs with the example of the Niger River, in Niamey, an area prone to heavy flooding due to the combination of two effects: slow rise the river (detectable with altimetry) and fast response due to nearby heavy rainfall events (detectable with satellite rainfall analysis). Figure 1. The Niger river near Niamey (red star) showing the main river and the 3 right bank tributaries, upstream of Niamey, that are responsible for heavy flooding early during the rainy season (July-September) before the main flood peak arrival (Nov-December). These early season floods – also called red floods - have been increasing drastically in the last decade (Casse et al., 2015a and 2015b). Left: superimposition of current operational altimetry tracks. Right: the future sampling with SWOT. Figure 2. Towards a prediction of Niger river flood in Niamey by combining monitoring of the upstream discharge by satellite altimetry and simulating the local runoff due to heavy storms near Niamey. Checking the consistency between independent satellite measurements of the water cycle can be used as an indirect validation method. A corollary outcome of the present work is to explore how altimetry measurement can help assessing the biases in rainfall products and their stability in time, in regions where no rain gauges are available. A preliminary illustration is presented below over the Congo river region. Paris et al. have developed a method to derive a first guess discharge from altimetry data anywhere along a river: the method is based on deriving height-discharge relationship from measured height and simulated discharge. The robustness of the derived height-discharge relationship is impacted by the quality of the rainfield used for forcing. 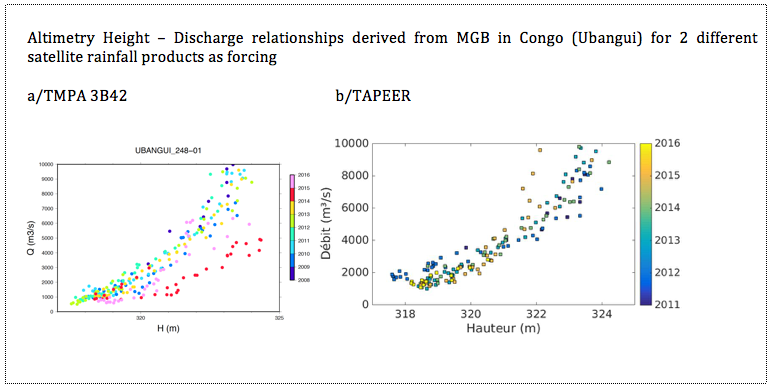 Preliminary comparisons are shown above when 2 different forcing are used to derive the relationship in the Congo river area. The left panel shows the results obtained using TMPA 3B32 (v7 – gauge adjusted version) and the right panel is for the Megha-Tropiques mission TAPEER product (Roca et al., 2016). Figure 3. Checking inter-annual consistency between the satellite observed height (x) and the satellite rainfall based simulated discharge (y) over the Ubangui sub-basin of the Congo. (2a) Forcing of the MGB model based on TMPA 3B42 v7 (gauge adjusted). (2b) Forcing based on TAPEER product. Falck A., Maggioni V., Tomasella J., Vila D. and Diniz F. (2015a). Propagation of Satellite Precipitation Uncertainties through a Distributed Hydrologic Model: A Case Study in the Tocantins-Araguaia Basin in Brazil. Journal of Hydrology. 10.1016/j.jhydrol.2015.05.042. Falck A., Vila. D. Tomassella J. and Maggioni V. (2015b). Avaliação de um Modelo Estocástico de Erro Multidimensional Aplicado a Estimativas de Precipitação por Satélite, Revista Brasileira de Meteorologia, RBMET-2014-0042. Roca R., Brogniez H., Chambon P., Chomette O., Cloché S., Gosset M.E., Mahfouf J-F., Raberanto P. and Viltard N. (2015). The Megha-Tropiques mission: a review after three years in orbit. Front. Earth Sci. 3:17. doi: 10.3389/feart.2015.00017. Casse, C., M. Gosset, C. Peugeot, V. Pedinotti, A. Boone, B.A. Tanimoun, B. Decharme (2015). Potential of satellite rainfall products to predict Niger River flood events in Niamey ; Atmospheric Research, doi:10.1016/j.atmosres.2015.01.010. Casse, C. and M. Gosset (2015). Analysis of hydrological changes and flood increase in Niamey based on the PERSIANN-CDR satellite rainfall estimate and hydrological simulations over the 1983–2013 period . Proc. IAHS, 92, 1–7, 2015 proc-iahs.net/92/1/2015/ Open Access doi:10.5194/piahs-92-1-2015. Paiva, R. C. D., W. Collischonn, M.-P. Bonnet, L. G. G. de Goncalves, S. Calmant, A. Getirana, and J. Santos da Silva (2013b). Assimilating in situ and radar altimetry data into a large-scale hydrologic-hydrodynamic model for streamflow forecast in the Amazon, Hydrol. Earth Syst. Sci., 17, 2929–2946, doi:10.5194/hess-17-2929-2013.